We have waited for the Aprilia SR150 for a long time. No, that doesn't imply an off-the-record conversation with Piaggio years ago. It simply means that the time for the Aprilia had come a while ago. 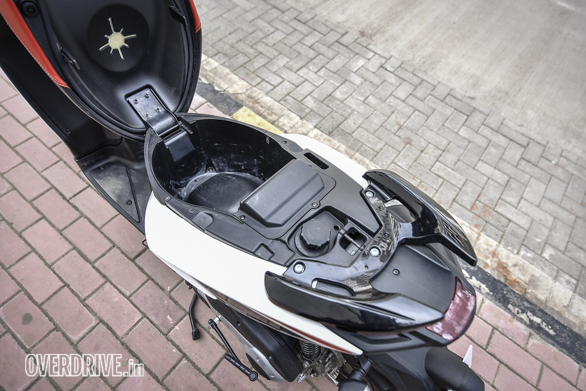 That we find it hard to believe that 31 per cent of the Indian two-wheeler market is looking for either an Activa or something that's exactly like the Activa but with different branding and colours. It simply isn't possible and it underlines the glacial pace at which scooters have evolved in India. And then, finally, boom. The Aprilia SR150 arrives. Unabashedly sporty in look, feel and intent. With a taut European feel that will piss off as many people as it will make fans for life. Is everyone ready for the Aprilia SR150? Perhaps not. But many are. 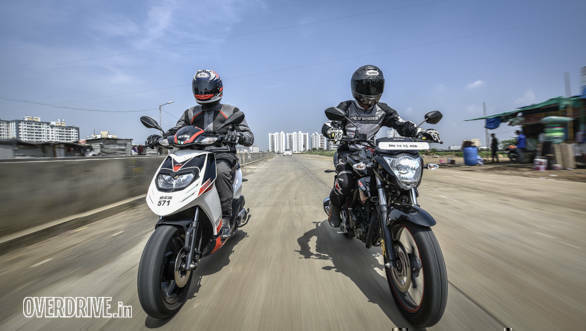 And just so everyone understands the score, we have it here slugging it out in the city with the Suzuki Gixxer, the king of the sporty/premium 150-160s in our books by some margin. If the Gixxer is a sweet, ripe organic-grown mango in a crate full of chemically ripened fruit, the Aprilia is a juicy orange in a field full of under-ripe citrus fruits. Time to make a fruit salad, then! A pair of stellar commuters these two are. The Suzuki Gixxer covers all the numeric bases and then proves to be a fun, involving motorcycle to ride. The Aprilia is the sportiest, most focused scooter money can buy in India. 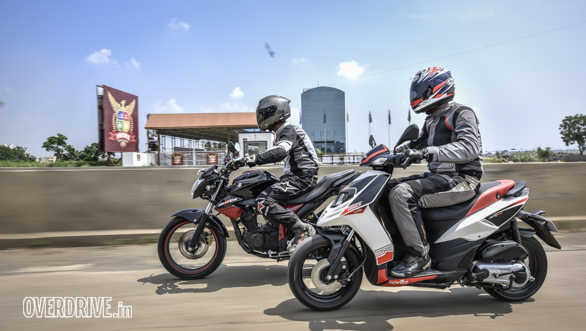 The Aprilia SR150 is most un-scooter like. Its 154.8cc engine idles with enough vibration to buzz the bars. Scooters don't do that, right? It reminds me every single time of the KTM 390 Duke which also displays bar vibes at idle that fade once you get rolling. 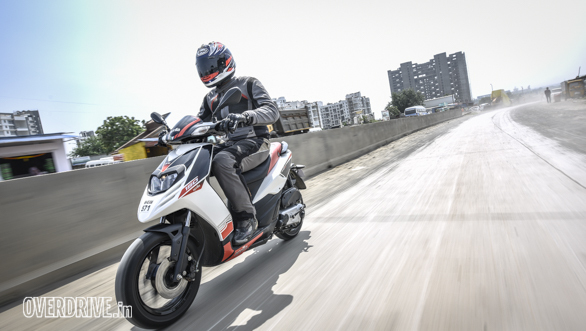 In fact, the smooth 154.9cc Suzuki is almost scooter-like in this regard. The 14.8PS Suzuki engine is supremely refined, not even allowing full revs to wrench loose its grip on noise or vibration. Only the engine note changes to a slightly more urgent octave. The 10.4PS Aprilia is all business. It sounds rorty and loud, again unlike a scooter. 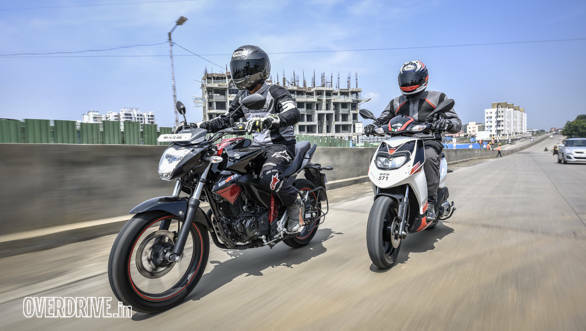 The SR150 uses a significantly shorter throttle travel (distance from closed to fully open throttle) as well as different gearing from the Vespa 150 it shares the engine with. This makes the SR150 feel vastly less elastic as the automatic transmission delivers power. The feel is tight and the power comes rapidly and eagerly. In fact, the Suzuki and the SR150 are nigh inseparable in traffic on engine performance up to 60kmph. Only once the roads open out and the traffic reduces that the Suzuki's most substantial top-end asserts itself. The Aprilia though will hit and maintain its top speed the whole day if needed, which again, is rare for scooters - most send out enough mechanical distress signals for you to back off and settle in 10-15kmph below flat out. Comfort is usually about separating the rider from the nonsense that municipal governments think are roads in India. The Aprilia pays our road conditions little mind. The suspension is unashamedly stiff and you will feel it as soon as you clamber on. The ride quality, in fact, reminds me strongly of the European-spec KTM 200 Duke that I got to ride once. There isn't any harshness and unlike other scooters. It is hard to hear that plastic-on-plastic sound that accompanies most scoots hitting bumps. But absorption is limited - no getting away from this. The Suzuki Gixxer is tuned for a competent ride quality that is biased towards absorption. It's nicely balanced so as to support the handling rather than interrupt it. Easily the more comfortable of the two bikes here. However, there are two things that you should consider. First, the suspension isn't incapable. The first time you hit a big crater, you will also note that the scooter seems to absorb it better than you expect it to. And that the forks never feel like they're relying on the tyres or the forks to handle the big hits. Second, once you learn to trust the Aprilia's uncannily motorcycle-like feel, you will also realise that it likes to have the gas open when it hits bad patches and then it is able to sail through them without significant deflection. Obviously, the Suzuki is vastly less focussed and therefore extremely adept in our conditions. It does make the Aprilia look needlessly stiff. In fact, the ride will be one of the reasons to not get an SR, and we will return to this in the verdict. Ah joy. 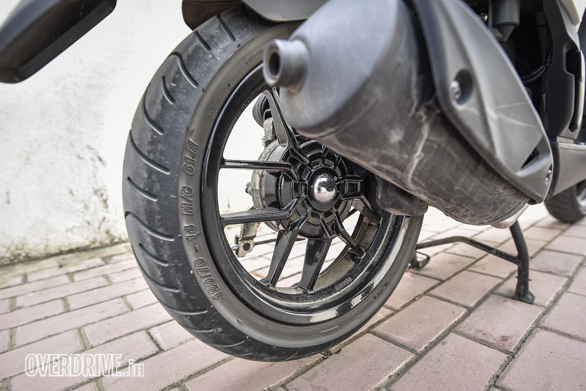 Both bikes have a solid set of tyres spec-ed in, and they're both sweet music around corners. Happy days. The Aprilia's the sharper knife in the drawer. The focus is intent and will take you by surprise. 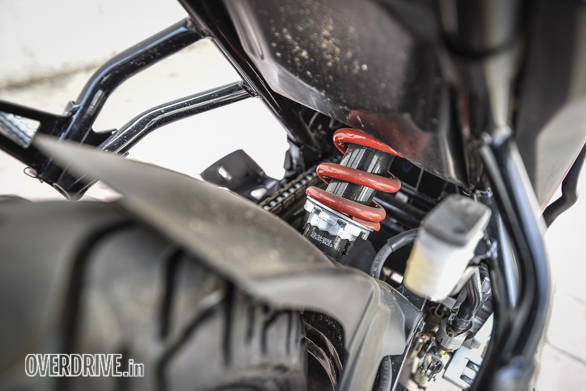 The firm suspension is matched to a new underbone frame that feels stiff - almost to the point where you think a bigger engine wouldn't go amiss - and extremely direct. The scooter turns in fast and hard and is grippy and stable mid-corner. Bumps will cause some movement, but if you stay on the gas, the Vee Rubber tyres have more than enough grip for almost anything you're up for. The short throttle and urgent power delivery also produce rapid exits. It's a motorcycle in this way, folks. 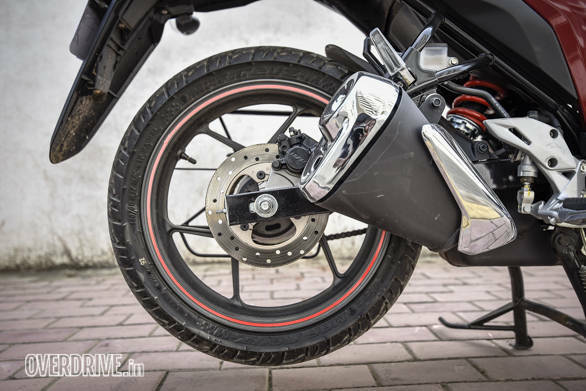 Aren't the Aprilia SR150's wheels just the best looking two-wheeler alloys in the business? But the Aprilia isn't a natural scooter that you will feel at home on. 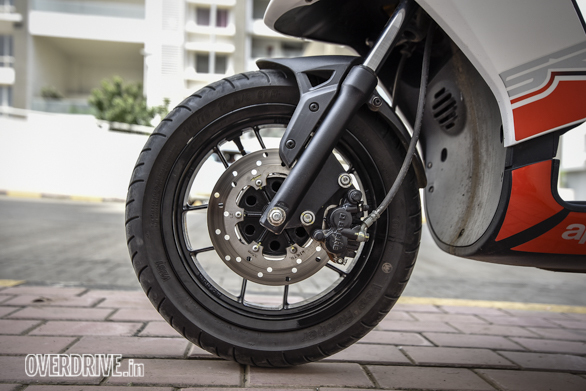 Like the KTM 390 Duke, the Vee tyres are an aggressively rounded profile. This allows the SR to drop into lean angles fast and hard, and it initially feels like it's falling in. You get used to it and you will notice the entirely missing top-heavy feel of a small-wheeled scooter. The Suzuki Gixxer is not shrinking violet either. It isn't as focussed as the Aprilia by any stretch of the imagination but it can corner. The grippy radials, a natural feeling chassis and absorptive suspension produce an almost effortless experience. The Gixxer gives you immense confidence and allows new riders to push a lot harder than they usually would. It's an able partner and pitch perfect for its target users. Both bikes have front discs, and the Suzuki also adds a rear disc from this model year. But the Aprilia's brakes are eye-opening. They're as focussed as the rest of the machine. Hard stops, supported by the Vees, can be produced on demand, and the rear brake is extraordinary well judged. It's always possible to take it to the edge of lockup, but actually locking it up is extremely hard to do. I'm a fan. If Ferocitas had brakes this good... Back to reality. The SR's brakes are aggressive, and I suspect that new riders will have to learn that they cannot grab a handful of the brakes - some skill will be required. The Suzuki has good brakes too, but they feel easier to modulate and the initial bite is notably gentler. Once again, the difference is more in feel than actual performance. Before you ask, the rear disc is technically irrelevant in this performance class. 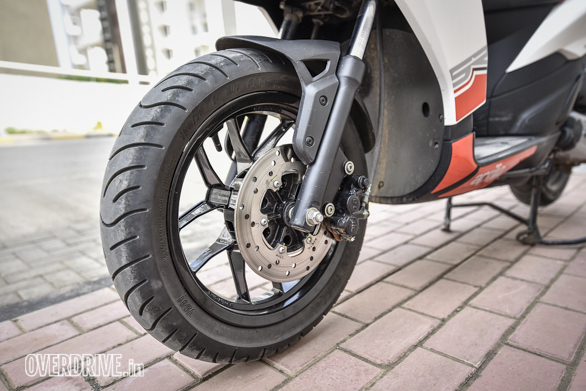 Honestly, Suzuki offers the rear disc because of popular demand, but the utility of a strong rear brake on a normal, well-ridden 150cc motorcycle is not a lot. The Suzuki's clearly better in the comfort department. It's got the better seat, it is more spacious and it has the better ride quality as well. And you can lean back a bit and chill at 40kmph or lean forward and find if the claimed top speed is real if you like. The Aprilia has, um, some offerings. Normally, a scooter would win at least in terms of space but not the SR. The underseat storage is about as large as most scooters in this space. The floorboard is cramped. My size 10 boots fill it up. 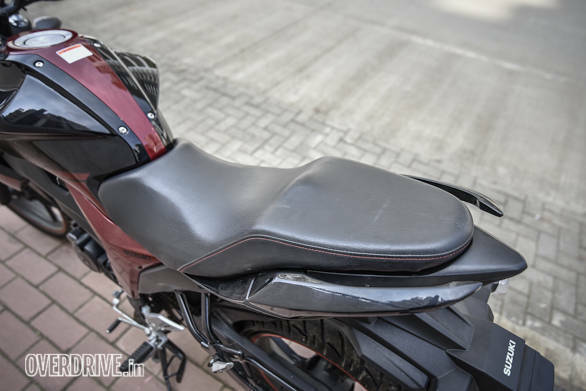 And I noted scratches from other testers' boots on both the front and rear panels on our 5,000km done test bike already. When I added my 22-litre backpack to the proceedings, space was at a premium. The narrow-skinny bodywork means the SR150 isn't a very practical scooter. The underseat storage is par for the course and if you have a reasonably good helmet, it's not going to fit in there. Note functional plastic filler cap. The Aprilia also has a seat that works for about an hour at a time. After that the gentle forward slope will begin to annoy, and it's constantly pushing you forward. Well, at Rs 11,000-odd higher, the Suzuki Gixxer is an extremely well-judged, fun to ride premium commuter. It understands the balance between performance, thrills, capability and utility better than all the 150s and 160s we tested in years. It's that kind of good. It also happens to be quite a bit quicker than the Aprilia numerically, have the higher top speed as well as greater economy. That's a solid purchase propostion right there. But don't dismiss the SR150 just yet. The Aprilia isn't very practical or very comfortable. But its focus and most un-scooter-like manners are charming and alluring. In my book, focussed machines make for better life partners despite their quirks and inflexibility. The SR150 is a direct and real threat to my wallet, honest. I think for most people the Suzuki Gixxer is the better bike overall. It will fade into the background most of the day when you're not in the mood for a lively conversation. And when you're in that kind of a state of mind, it's able to come alive and hold your attention too. And even if you think motorcycles are inanimate objects, the Suzuki has all the comfort and capability you need. The SR150 isn't the most practical of scooters. But it's focus produces a deliciously sporty, uncompromising ride. Many will hate the firm ride and all that. But there's no getting away from it, I believe this is the most desirable scooter on the market right now. But I, personally, find great joy in the focus and performance of the SR150. If you're a scooter enthusiast looking for an upgrade, this is it. No matter what you ride, the Aprilia is a thrill-a-minute ride that is currently unrivalled in India. You'll have to live with the buzz in the bars, the cramped footboard et al. But trust me, you'll be smiling a lot. Because the Aprilia SR150 simply doesn't know how to fade into the background. Yes, there is the matter of Rs 30,000-odd that separates these two engine-siblings. And that, I'm going to say, is your lookout. I still don't understand the logic of Vespa pricing in India. But when I rode the Vespa 150 back to back, I understood just how wide the gulf in feel, nature and role between the Aprilia and the Vespa. The Vespa immediately felt more laid-back, more comfy and like it was absorbing more of the road. Very pleasant and likeable. But in the corners, the Vespa monocoque felt top-heavy and, er, a little loose. Now, if you think back to our scooter test on a go-kart track years ago, you will remember that the Vespa monocoque slotted into second position on that test. And that was primarily because the anti-dive front brake set-up interferes with faster riding. 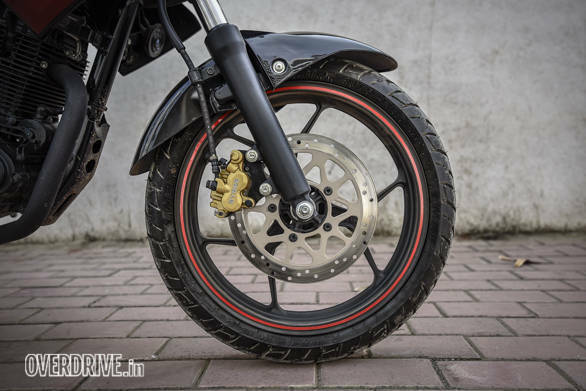 But so much better is the SR150 with its 14-inch wheels that the handling (and braking) contest is a no-brainer. That said - it's clear I'm deeply enamoured of the SR150 - I rather enjoyed the difference between the two. Even with the price being disregarded, I cannot imagine anyone having trouble deciding between the soft-relaxed Vespa and the hard-sporty SR150.